Welcome to VintageMagic.com, LLC the world leader in vintage MTG rarities. Our eBay store offers the widest selection of artwork, sketches, artist proofs, altered & signed cards and graded & ungraded cards. 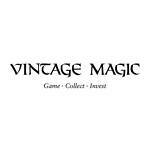 Visit the Vintage Magic store @ www.vintagemagic.com for our complete inventory. Vintage Magic | MTG MINT Summer Magic Wrath of God, BGS QUALITY, NO RESERVE!!! Vintage Magic | 1x MTG Factory Sealed Ice Age Booster Pack | Necro/Snow/Brain??? Vintage Magic | MTG Beta Gaea's Liege | HP Condition, OLD SCHOOL!!! Vintage Magic | MTG Alpha Savannah Lions | NM/Mint Condition, RARE, BUYOUT!!! Vintage Magic | MTG MINT PSA 9 Alpha Psychic Venom | OLD SCHOOL!!! Vintage Magic | MTG Weatherlight Lotus Vale, NM/Mint Condition, RARE!!! Vintage Magic | MTG Alpha Drain Power | LP Condition, OLD SCHOOL!!! Vintage Magic | MTG Alpha Wheel of Fortune | HP Condition, OLD SCHOOL!!! Vintage Magic | MTG Beta Northern Paladin | HP Condition, OLD SCHOOL!!! Vintage Magic | MTG Alpha COMPLETE BASIC LAND SET [10x Cards], OLD SCHOOL!!! Vintage Magic | MTG Legends Land Tax, NM+ Condition, OLD SCHOOL!!! Vintage Magic | MTG Alpha Fireball | NM/MINT Condition, OLD SCHOOL!!! Vintage Magic | MTG Unlimited Armageddon | NM/MINT Condition, OLD SCHOOL!!! Vintage Magic | MTG Nemesis FOIL Daze | NM/MINT, Legacy, Commander, PIMP!!! Vintage Magic | MTG Beta Clone | HP Condition, OLD SCHOOL!!! Vintage Magic | MTG Alpha Channel | NM/MINT+ Condition, OLD SCHOOL!!! Vintage Magic | MTG Arabian Nights City of Brass | LP Condition, OLD SCHOOL!!! Vintage Magic | MTG Alpha Disintegrate | MINT Condition, OLD SCHOOL!!! Vintage Magic | MTG Beta Icy Manipulator | HP Condition, OLD SCHOOL!!! Vintage Magic | MTG Unlimited Goblin King | NM/MINT Condition, OLD SCHOOL!!! Vintage Magic | MTG Legends Thunder Spirit | NM/Mint Condition | RESERVE LIST!!! Vintage Magic | BGS 9.5 MTG Unlimited Bayou, QUAD, RESERVE LIST!!! Vintage Magic | MTG Beta Hypnotic Specter | HP Condition, OLD SCHOOL!!! Vintage Magic | MTG Unlimited Copy Artifact, EX/MINT Condition, RESERVE LIST!!! Vintage Magic | MTG Alpha Demonic Attorney | NM/MINT Condition, OLD SCHOOL!!! Vintage Magic | MTG 1993 Alpha Starter Deck Rule Book from Starter Deck!!! Vintage Magic | MTG Beta Ice Storm | MP Condition, OLD SCHOOL!!! Vintage Magic | MTG Beta Animate Dead, NEAR MINT Condition, OLD SCHOOL!!! Vintage Magic | Signed MTG Beta Pirate Ship, LIGHTLY INKED, RARE SIGNATURE!!! FACTORY SEALED Pokemon Unlimited Neo Revelation Booster Pack, BGS/PSA/HOLOFOIL? Vintage Magic | MTG Alpha Shivan Dragon | NM/MINT Condition, OLD SCHOOL!!! Vintage Magic | MTG Legends Willow Satyr, NM/MINT+ Condition, RESERVE LIST!!! Vintage Magic | MTG Alpha Serra Angel | HP Condition, OLD SCHOOL!!! Vintage Magic | MTG Alpha Lightning Bolt | EX/MINT Condition, OLD SCHOOL!!! Vintage Magic | 1993 SIGNED MTG Antiquities Tawnos Coffin | MINT, RESERVE LIST! !